Inside Eric Goldie — From Reality TV to Conquering NYC Real Estate! Compass real estate agent, Eric Goldie, finds success by combining his presence on social media with his work in real estate. 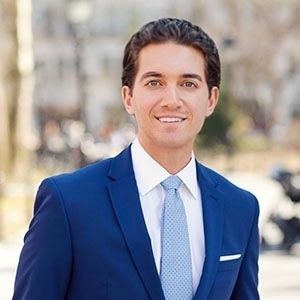 As a longtime resident of New York City, Eric represents the standard of real estate expertise necessary to help clients explore the ever-changing NYC housing market. His sharp eye for luxury and his partnership experiences with brands such as Brooks Brothers, Macallan, and Town and Country, contribute to his ability to target the best in meeting his clients’ real estate needs. Detail oriented, persistent, and personable, he works tirelessly and patiently to deliver high quality results. Currently a Soho resident, Eric studied Marketing at Miami University, where he was Public Relations Chair of the Beta Theta Pi fraternity. Upon graduation, he began his career in the NBC Page Program, where his assignments included Saturday Night Live. Subsequently Eric worked at PEOPLE Magazine, where he produced the site's first ever live web-series, PEOPLE Now. After transitioning into digital marketing, he found his passion for negotiation and sales. Serving multiple clients, each having a different goal, Eric fulfilled the singular needs of the particular client, focusing on the best approach necessary to achieve success. Eric works with each client to develop a personalized approach, tailoring his skills to the client’s specific needs. Eric supports various non-profit organizations including The New York Botanical Gardens and the amfAR Organization. He also serves on the board of the Old Line Society, a 501(c)(3) charitable organization that promotes social engagement and fundraising efforts among young professionals in support of charitable and cultural organizations. He also enjoys traveling and keeping fit.